The deathstalker is regarded as the most dangerous species of scorpion. 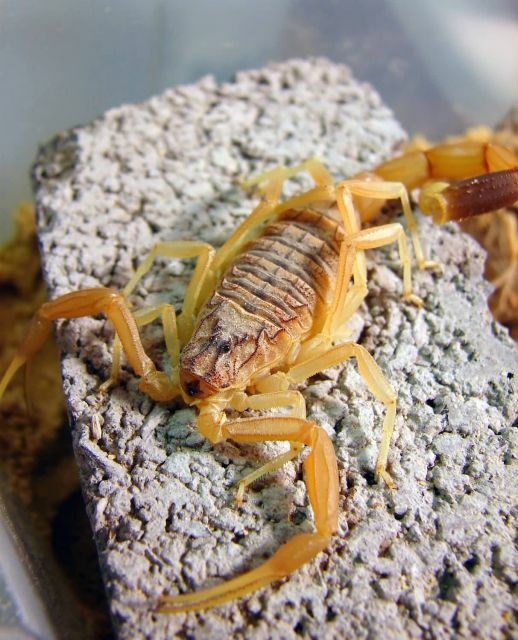 It is also known as the Palestinian yellow scorpion, Palestine yellow scorpion, Omdurman scorpion and Naqab desert scorpion. Its venom is a powerful mixture of neurotoxins with a low lethal dose. While a sting from this scorpion is extraordinarily painful, it normally would not kill a healthy adult human. However, young children, the elderly or infirmed (such as those with a heart condition and those who are allergic) would be at a much greater risk. One component of the deathstalker’s venom, the peptide chlorotoxin, has shown potential for treating human brain tumors. There has also been some evidence to show that other components of the venom may aid in the regulation of insulin and could be used to treat diabetes.